For the sake of this demonstration, I will be looking at the frequency anomalies, using a DPO circuit board and MSO2024 Oscilloscope courtesy of Tektronix. Previously, I wrote a blog on Frequent engineers/designers mistakes specifying power products on the powersupplytips.com site. In this blog, there are questions to what designers should pay attention to. Designers need to have a specification list and answer the questions in the blog when testing/specifying power products. To answer two questions in the blog, “What signals are being tested/measured?” and, “What are the noise sources?” this demonstration will focus on glitches and runts in the frequency anomoly and trigger on a narrow digital pulse of a signal behavior. To test a power supply, the type of equipment needed is: dc power supply (of course), two ammeters (one for the input, one for the output), the device under test (which can be a circuit board with a buck converter), two volt meters (one for the input, the other for the output), electronic load connected to the second ammeter, an oscilloscope and a frequency response analyzer for stabilizing measurements. I have set the scope up with this board applying my probes to the frequency anomalies and ground. To take the digital signal, I triggered the signal on the D3 channel. Then I used the channel 1 signal to view the analog signal. I will be using the pulse width trigger to capture a narrow positive pulse. As you can see, the low-amplitude “runt” pulse near the center of the display is not visible on the digital waveform. Since the scope digital inputs view the signal like a digital circuit, it will show a transition if the signal crosses the set threshold. In this case, the runt did not cross the logic threshold and therefore, doesn’t appear in the digital waveform. In a nutshell, if you are designing a power product and cannot pinpoint problems in the signal’s behavior, look at the signal’s behavior and see if the analog characteristic is a representation of the flawed digital signal. 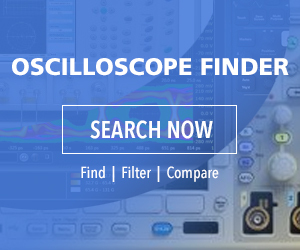 For more information please visit Tektronix at www.tex.com.